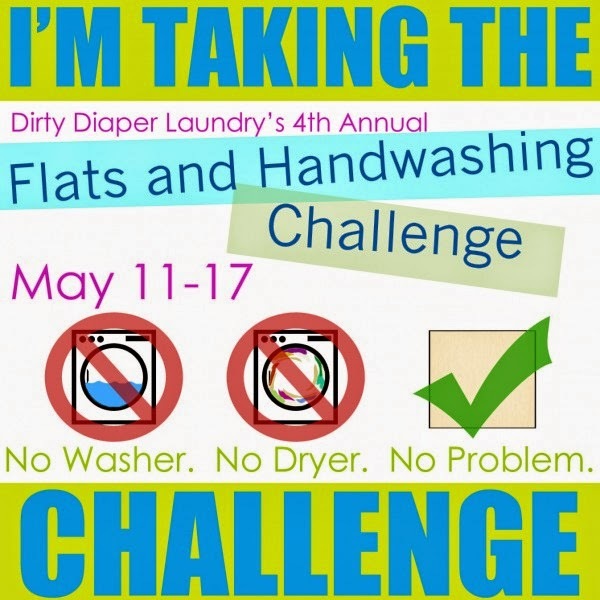 I’m taking the Flats & Handwashing Challenge this week. Why am I taking the challenge? 1. I plan on using prefolds and covers on the newborn baby arriving in July so this will be a good chance to practice my folding skills. I used some Gerber prefolds and rubber pants on Miss Raegan when she was a newborn and I wasn’t impressed. We used them to fill in while I built our stash of pockets. Pockets seemed much easier and microfiber inserts were more absorbent than the prefolds I had. I loved the jellyroll fold and couldn’t really get any other folds to work for me. I’m excited to try out some new ones. 2. I’ve never used flats. I hear flats are great. I don’t know why flats are so great, so I’m looking forward to finding out for myself. I made the switch from microfiber inserts to cotton & bamboo prefolds with hemp inserts and I like the results so far. Currently, my routine is to hang my covers (pockets) on the clothesline and dry my inserts and prefolds in the dryer, because otherwise they take forever to dry! I hear flats wash really well and dry much more quickly than prefolds and inserts. Bamboo prefolds are my favorite, but maybe that will change after this week! 3. I want to learn to handwash. I want to spend more time camping. With Landon in Cub Scouts and my husband an Eagle Scout, our family jumps at the chance to go outside. In the past I’ve used disposables while camping to avoid extra laundry. But, since Raegan’s battle with diaper rash last fall, I’ve avoided disposables as much as I can… including traveling less to avoid laundry issues. With two in diapers this summer, it would be nice to have the handwashing experience if we decide we want to get away for a weekend. Maybe I will fall in love with handwashing and decide to handwash all the time to save on electricity! Maybe not. But I hope it will be a good learning experience. 4. I love a good challenge. Especially one with blog prompts. I like writing. I like trying new things. I’m bored, because I’m stuck here on the couch most of the time waiting for my leg to heal. This challenge is giving me something else to think about — instead of sitting here thinking about all the cleaning jobs that I can’t do with crutches. I never thought I would want, so desperately, to vacuum the floor, or wash the windows, or finish painting the trim! That is, until I sat here in the living room for six weeks staring at all of the things that need done. You know the feeling, when you walk into a room, you stop, and think, “Why did I come in here?” That happens to me more often if I’m constantly going up and down the steps. Put a basket at the bottom of your staircase to collect anything that needs to go up. Every time you do need to go upstairs, take a few things with you. I do this with laundry baskets, too. I wait until I need to go upstairs to carry the clothes up… sometimes my knight-in-shining-armor carries the heavy baskets for me! and I can’t get up!! I fell down the steps. To me, that sounds so much more dramatic than what really happened. I couldn’t find the skirt I wanted to wear, so I took a basket of laundry upstairs where I could empty it, sort it, and make sure my skirt wasn’t in there. Then, I thought, I might as well fill this basket with the dirty clothes so I can start another load. I even counted the steps on the way down. I knew there were fourteen. I knew I couldn’t see over both the clothes basket and my growing belly. So at step number 12, I stopped and peeked under the basket to make sure there were no hoodlums lingering at the bottom of the steps. Next thing I knew, I was sitting on the bottom step. One leg under me and one leg in front of me. I’ve fallen before. Many times. I just get up. I’m usually mumbling that my husband doesn’t always need to frantically ask me “Are you okay? !” over every bump and bruise. I know why he does it now. He called my mom to watch the kids and pulled our new-to-us minivan around to the front door. He carried me out to the van and drove as quickly and as slowly as he could — being careful not to hit too many bumps while getting to the hospital as quickly as possible. He drove in circles around the parking lot until he had aligned my door perfectly with the hospital entrance. I got to ride in a wheelchair. It wasn’t as exciting as it had always seemed. They checked the baby before they checked my leg. In my pain-filled haze, I remembered — Don’t tell my husband the gender of the baby! Priorities, people. Baby was 25 weeks and perfectly fine. No. I am not having surgery. We followed-up with an orthopedic doctor who said I might not need surgery. I never realized how painful a broken bone is. I actually have three broken bones. But still. It hurts more than I imagined. And I just feel so helpless. I have amazing friends and family who have bent-over-backwards to help me. But, I’m helpless. I’m helpless because I’m proud. I want to do it myself. Just like my toddler. No. Don’t help me get dressed. I would rather take three times as long struggling on my own than admit that you can do it faster. I’ll accept help. I just don’t want to ask. I desperately want to be able to do it by myself. And, asking you… that hurts twice as much as struggling on my own. But, I’m learning. I’m learning to be resourceful. I’m learning to be humble. I’m learning to ask for help when I need it. I’m learning to be still. I’m learning to focus less on the stuff and the tasks and more on the people in my life. I’m scheduling that dreaded surgery because my bones are not healing correctly after three weeks in a cast. Then I’ll be in another cast for six more weeks. I’m now 28 weeks pregnant… so hopefully I will at least be able to walk when I go into labor! But, if not, I’m sure I’ll learn something from that, too.